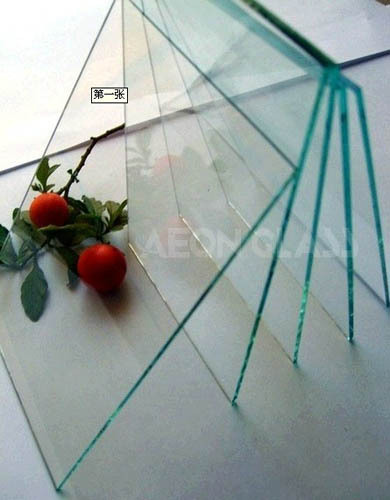 AEON CLEAR SHEET GLASS is the same as the Glaverbel glass, it is also named pull from the deep pool, it is improved by Belgian from the pull from the shallow pool. The material of the glass melt In the furnace and it becomes glass fluid and then the glass fluid after clarifying and cooling down, it is pulled up by the lift rollers to the molding pool, with the turn of the Colburn process, it can be controlled and then come into the annealing. After cooling down by the annealing, the glass will come to the conveyors rollers to the cold end, where we do the work of cut and packing. The surface of the glass is smooth and flat. It is mainly applied in the field of construction and decoration such as photos frame and door & windows. As the technology more and more mature, the glass is not only excellent product and cheaper price, but also durable in use. The sheet glass has great market competition advantages. 1) High light transmittance, excellent optical performance. 3) Easily to be cut, insulated, tempered and coated. Thickness: 1.3mm 1.5mm 1.8mm 2mm 2.2mm 2.7mm 3mm etc. Sizes: 1220x912mm, 1524x2134mm, 1830x1220mm etc. Cutted sizes are also available. Sizes: 1524x2134mm, 1220x1830mm, 1600x2400mm, 1830x2440mm, 1800x2600mm, 2134x3050mm, 2134x3300mm, 2134x3660mm, 2250x3300mm etc. can be produced according to client閳ユ獨 request. 1. 10 years experiences on glass manufacturing and exporting. 2. Top quality glass with CE certificate, exporting to more 60 countries in the world.